This 2 bedroom apartment is located in Trnovo and sleeps 5 people. It has WiFi, parking nearby and air conditioning. 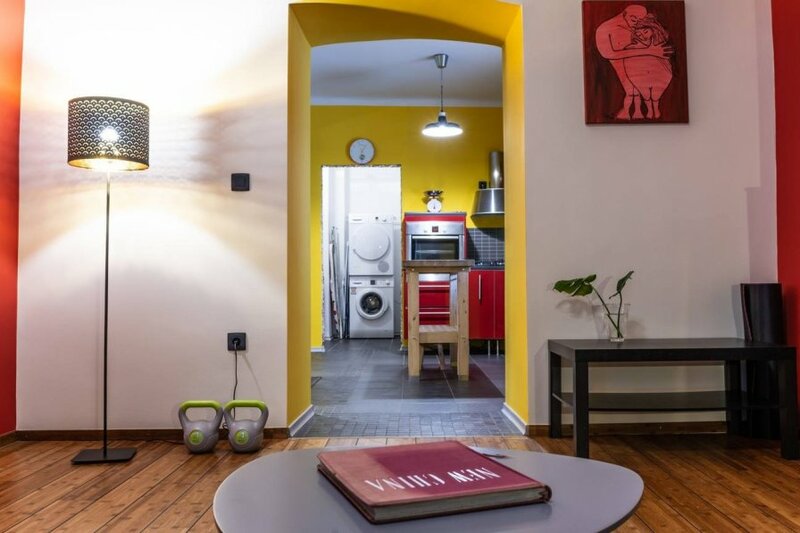 It's a charming, pet-friendly family home (102m2) in a green street lined with embassies, a few feet from the river, and parking for two vehicles - perfect for day trips to beautiful lake Bled, gorgeus mountains and our adriatic coast! This house has been home to countless families for almost two centuries, and now it's your chance to experience it. The house was build in 1853, but don't let its old age fool you, it's been recently renovated with a fully quipped kitchen, AC and soundproof windows that will drown out anything short of a meteor impact. gas stove, electic oven, fridge & freezer, microwave, kettle, toaster and coffee machine..basicly everything to prepare a delicious meal. To say, kitchen that even the most demanding chefs would look at with only slight disapproval. Then there's the massive common area, with a large dining table that seats six, enough room for the kids to do all the weird stuff kids seem to enjoy. Where should I start? I mean, the rooms are large. Not Texas large, but the master bedroom alone comfortably fits storage for more clothes than you could possibly fit in a car-a double bed, a single bed, and space for a dog bed and it comes with full ensuite bathroom with a fancy bathtub! The living room/second bedroom is the same size as the master bedroom, with a high quality leather pull out sofa, that converts into bed for two additional guests. There's a second couch and loads of books and DVDs, as well as a TV with loads of channels, most of them in English. We're also happy to provide you with a list of all our favourite rainy day spots in Ljubljana. A collection of inspiring books to get lost in. Good option for a rainy day, or for when you need a break from the sightseeing. Finally, there's the utility space with a washer and a dryer which you're welcome to use, so you can pack lightly . Laundry detergent and fabric softener are readily available. Also an iron and ironing mat to so you iron any wrinkles out before going out for dinner. Then there's the home office, private and bright space with a lovely work desk and enough outlets to charge every gadget, and space for another dog bed. While it's a bit smaller than the master bathroom and only has a shower, it still has all the essential fixtures you'd expect from a bathroom, reducing the chances of bathroom wars breaking out. Need to tell your friends about the amazing time you're having? Ljubljana without worrying about your data plan. We'll decipher those bastards to the best of our ability for you. Need a suggestion for a day-trip? We do one almost every weekend, and almost never to the same place. In other words: we'll do our best to be your living search engine for both Ljubljana and Slovenia for as long as you stay. If you're arriving between 15:00 and 20:00 (3:00 PM and 8:00 PM) and you'd like us to check you in personally, just let us know and we'll meet you at the property. Otherwise, we'll provide you detailed instructions for checking in (don't worry, it's very simple). There's five embassies within a 5 minute walking radius, adding to the feeling of security. And finally, it employs the best security system ever - the Slovene granny. There's three of them in the neighbouring houses, and what with their insomnia and aching backs, at least one of them is awake and observing the neighbourhood like a slightly judgmental, gossipy hawk at any given moment. You're in the safest bit of the safest capital in Europe. • 12 minutes drive from the main rail station. • 10 minutes walk from Old Town. If you arrive by car, there's a free secure parking space infront of the house.